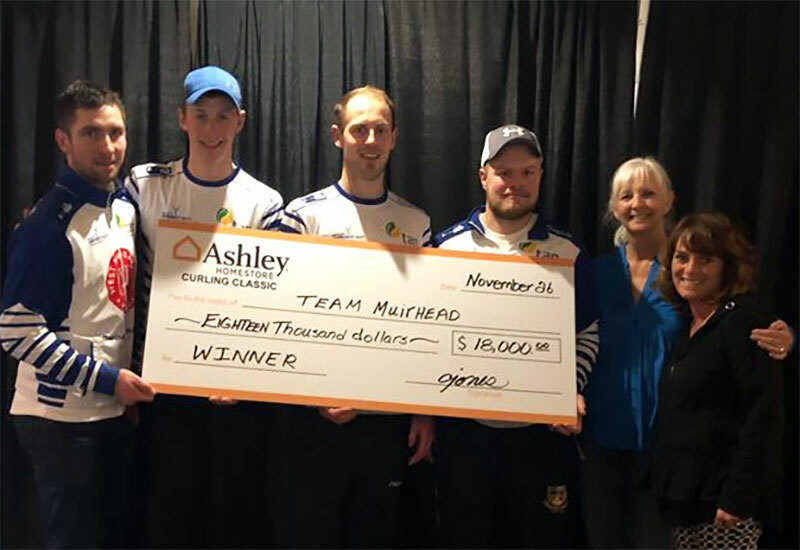 Glen Muirhead (Perth, Scotland) wins the Ashley HomeStore Curling Classic, defeating Ross Paterson (Glasgow, Scotland) 5-4 in an extra end at the Penticton Curling Club in Penticton, Canada. Muirhead with Kyle Smith at third, Thomas Muirhead and Cameron Smith on the front end take home the $19,000CDN first place cheque along with 61.055 world ranking points, while Paterson receives $12,800CDN and 44.773 world ranking points for their second place finish. Starting with hammer, Muirhead scored 1 in the first end, then forced Paterson to a single in the second end. Muirhead scored a single in the third end, then after a blank end, Paterson scored 2 in the fifth end to take a 3-2 lead, Muirhead responded in the sixth end scoring 2, then, after a blank end, Paterson was forced to a single the eighth end to send the game to an extra end. After a well played end where both tick shots were made, Muirhead was left with an open hit for the 5-4 win. In the semifinals, Muirhead defeated Matt Dunstone (Regina, Saskatchewan) 8-5 and Paterson defeated Jason Gunnlaugson (Morris, Manitoba) 9-6. Dunstone won $7,000CDN, while Gunnlaugson won $6,600CDN along with each receiving 34.598 ranking points for their semifinal finishes. In the quarterfinals, Muirhead defeated Charley Thomas (Toronto, Ontario) 3-0, Paterson defeated Reid Carruthers (Winnipeg, Manitoba) 7-5, while Gunnlaugson defeated Brendan Bottcher (Edmonton, Alberta) 7-4 and Dunstone defeated Kevin Koe (Calgary, Albera) 5-3. Bottcher won $4,000CDN, while Carruthers, Koe and Thomas earned $3,800CDN along with 24.422 ranking points for their quarterfinal finishes. Muirhead went 5-0 in the 24 team round robin pools qualifying round. In their opening game, Muirhead defeated Tyler Tardi (Langley, BC) 9-3, then won 6-4 against Neil Dangerfield (Victoria, BC) and 6-5 over Qiang Zou (Beijing, China). Muirhead then won against Koe 6-4, and finished the round-robin with an 8-5 win against Kirk Muyres (Saskatoon, Saskatoon).